One of the best ways to succeed in social media marketing is to not be afraid to test and fail. The landscape is ever changing, and as marketers, we need to adapt quickly and learn from others. Social Media Marketing World (#SMMW15) this week in San Diego is just the type of conference that can provide marketers this opportunity. If you’re not able to attend, don’t worry. Brooke Furry and I will be attending #SMMW15 in order to learn, network and create content (live blog) many of the most important presentations. We’re committed to providing you with social media marketing insights and highlights to inspire you to succeed. The speaker list reads like a who’s who in social media. I’m extremely excited to hear Guy Kawasaki, chief evangelist, Canva, in-person. He has more than one session, and I’m having a hard time choosing which to attend! Chris Brogan, co-author of The Impact Equation and CEO, of Human Business Works, is another of the top social media minds you want to pick and pick and pick…. The conference has him opposite Guy Kawasaki twice, so I have to choose between them. If you haven’t heard Jay Baer, author of Youtility, speak, you are missing-out. I’ve met Jay on a few occasions, and he always provides great actionable tips in his presentations, which I can take back to help my clients. And, he’s a really cool, nice guy. Blogger, speaker, educator and consultant Mark Schaefer just wrote a new book, The Content Code (find a review by Lee Odden here), and, I hear he has a new presentation. I have the opportunity to work with Mark on the Dell Insight Partners program, and the conference will allow me to finally meet him in-person. The list of speakers and sessions is overwhelming! There are several friends, former clients and other great minds I need to hear speak or corner them at one of the many networking events! Like probably every SMMW attendee, I would appreciate a time-turner ala Hermione Granger to enable me to sit in on more sessions, as the speaker line-up is epic. For starters, Joe Pulizzi, who pioneered the term “content marketing” back in 2001, is slated to share insights on creating a content marketing strategy first thing Thursday. How will he boil down 14 years of learning into 45 minutes? When I got my first digital marketing job, Michael Stelzner’s Social Media Marketing podcast fed me insights that even a beginner could swallow. I listened to him all the time. It’s hard to believe that when Michael gives his keynote on March 26th, I’ll be listening live instead of tuning in from the treadmill or my car. Authors Brian Clark and Ann Handley will both share their top writing/blogging secrets in author spotlight sessions. If you’re familiar with Copyblogger and MarketingProfs, you know these two are the real deal when it comes to coaching marketers on the art and craft of writing. 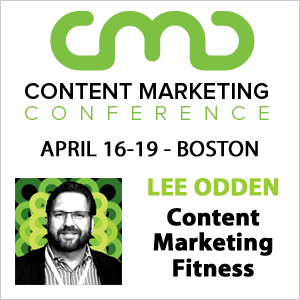 Of course, TopRank Marketing CEO Lee Odden is speaking, too! Before I came to TopRank, I listened to Lee’s presentations and found him to be a riveting, knowledgeable presenter. If you are attending the conference (either in-person or online) be sure to check-out his presentation on Friday at 3:00 PM PDT. Aside from gaining social media insights from the pros, we’ll be doing quite a bit of real-life socializing with said pros and other attendees. I’m looking forward to the ample time the conference sets aside for connecting. How many people can say they’ve networked on an aircraft carrier, at the beach, or while powering through a 6 a.m. walk or run? Finally (I’d be lying if I didn’t say it), California sunshine at the end of a long Minnesota winter is sounding quite lovely. We’re looking forward to live-tweeting and live blogging from the shores of San Diego. Follow us on Twitter @writerbrooke and @dfriez and come back soon for live updates from this year’s most exciting social media marketing conference! If want a good primer to the event, check out the conference eBook we created for SMMW14 including social media marketing tips from 38 brands and influencers.